‘I’m an accidental environmentalist,’ said Richard Hardiman, who runs a project called WASTESHARK. He says that while walking at his local harbour one day he stopped to watch two men struggle to scoop litter out of the sea using a pool net. Their inefficiency bothered Hardiman, and he set about trying to solve the problem. It was only when he delved deeper into the issue that he realised how damaging marine litter, and plastic in particular, can be, he says. ‘I started exploring where this trash goes – ocean gyres (circular currents), junk gyres, and they’re just full of plastic. I’m very glad that we’re now doing something to lessen the effects,’ he said. The design of the autonomous drone is modelled on a whale shark, the ocean’s largest known fish. These giant filter feeders swim around with their mouths open and lazily eat whatever crosses their path. It’s powered by rechargeable electric batteries, ensuring that it doesn’t pollute the environment through oil spillage or exhaust fumes, and it is relatively silent, avoiding noise pollution. 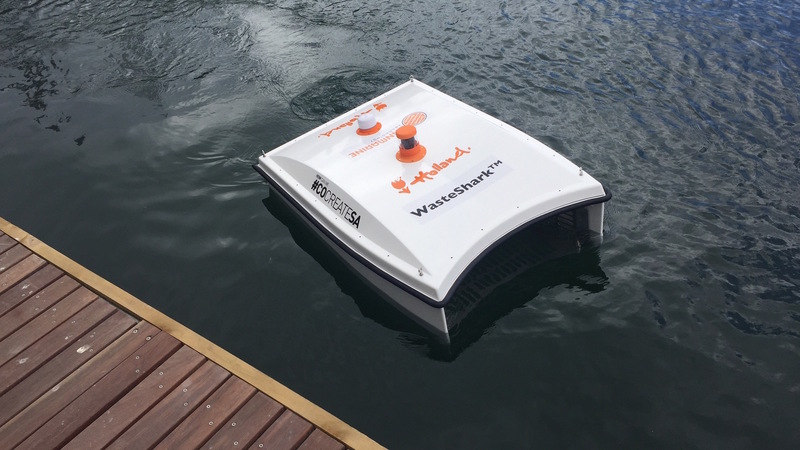 It produces zero carbon emissions and the device moves quite slowly, allowing fish and birds to merely swim away when it gets too close for comfort. CLAIM’s pyrolyser will use heat treatment to break down marine litter to a useful gas. Plasma is basically ionised gas, capable of reaching very high temperatures of thousands of degrees. Such heat can break chemical bonds between atoms, converting waste into a type of gas called syngas. The pyrolyser will be mounted onto a boat collecting floating marine litter – mainly large items of plastic which, if left in the sea, will decay into microplastic – so that the gas can then be used as an eco-friendly fuel to power the boat, or to provide energy for heating in ports. The researchers chose areas in the Mediterranean and Baltic Seas to act as their case studies throughout the project, and will develop models that can tell scientists which areas are most likely to become litter hotspots. A range of factors influence how littered a beach may be – it’s not only affected by litter louts in the surrounding area but also by circulating winds and currents which can carry litter great distances, dumping the waste on some particular beaches rather than others. CLAIM’s other methods to tackle plastic pollution include a boom – a series of nets criss-crossing a river that catches all the large litter that would otherwise travel to the sea. The nets are then emptied and the waste is collected for treatment with the pyrolyser. There have been problems with booms in the past, when bad weather conditions cause the nets to overload and break, but CLAIM will use automated cameras and other sensors that could alert relevant authorities when the nets are full. Large plastic pieces that can be scooped out of the water are one thing, but tiny particles known as microplastics that are less than 5mm wide pose a different problem. Scientists on the GoJelly project are using a surprising ingredient to create a filter that prevents microplastics from entering the sea – jellyfish slime. Jellyfish are one of the most ancient creatures on the planet, having swum in Earth’s oceans during the time of the dinosaurs. On the whole, due to a decline in natural predators and changes in the environment, they are thriving. When they bloom, jellyfish can attack swimmers and fisheries. Fishermen often throw caught jellyfish back into the sea as a nuisance but, according to Dr Javidpour, jellyfish can be used much more sustainably. Not only can their slime be used to filter out microplastics, they can also be used as feed for aquaculture, for collagen in anti-ageing products, and even in food. In fact, part of the GoJelly project involves producing a cookbook, showing people how to make delicious dishes from jellyfish. While Europeans may not be used to cooking with jellyfish, in many Asian cultures they are a daily staple. However, Dr Javidpour stresses that the goal is not to replace normal fisheries. The research in this article has been funded by the EU.